Holocene Music is beyond stoked to present the debut full-length from Portland, Oregon jangly pop wunderkinds The Shaky Hands. 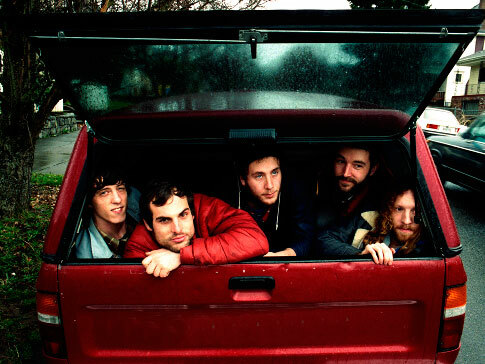 Sliding bouncy go-go beats under shambling guitars and reedy, swooning vocals, Shaky Hands make the kind of catchy, soulful indie rock that’s tailor-made for brokedown car stereos and river-rat boomboxes. Their debut album’s 13 tracks glow with a sloppily romantic warmth that’s equal parts summer sunshine and candlelit mellow, pre-party buzz and scruffy day-after fuzziness. The result is a fully formed and confident debut; a big-hearted, starry-eyed bear hug of a record, full of youthful energy and tumbling vigor, just waiting to back new adventures and comfort old friends. 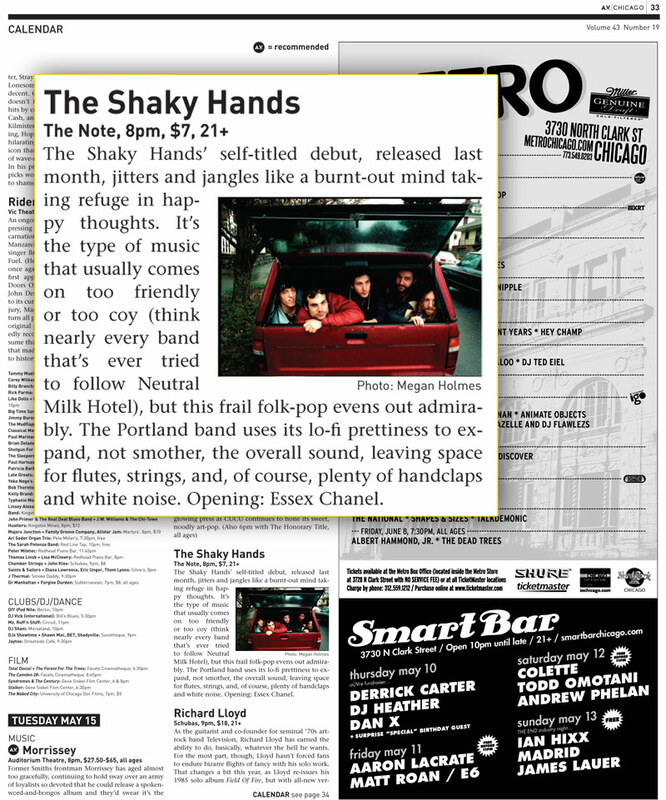 The Shaky Hands formed in Portland in the fall of 2003. They began as a three piece with Nick Delffs (also of Castanets) playing guitar and singing, Colin Anderson playing drums and Paul Culp on bass. That year was spent performing in basements and living rooms. Following Culp’s departure in 2004, Mayhaw Hoons and his hair joined the band, soon followed by second guitarist Jeff Lehman. Around this time Nick and Colin traveled to Bonny Doon, California and recorded a self-titled EP with Nick’s brother Nathan, which was subsequently self-released on CD-R. In 2006 Nick, Colin, Mayhaw and Jeff recorded this (amazing) debut full-length at Sidecar Studios in Portland, before bringing on Nathan as an official member that spring. Now five strong with Nathan on pedal steel and percussion, The Shaky Hands are a visceral, life-affirming live experience that will totally make you hug the person standing next to you.